(CNSNews.com) - The percentage of U.S. households with annual incomes of at least $100,000 hit 29.2 percent in 2017, according to data published today by the Census Bureau. That is up from 25.7 percent in 2013, which is the earliest year for which the Census Bureau has consistent data for household incomes. In 2017, according to the Census Bureau’s Income Table A-1, there were 127,586,000 households in the United States. In the table, the bureau divided these households into nine different income brackets and published the percentage of the total households that fell into each bracket. According to the bureau, 10.7 percent of the nation’s households had incomes under $15,000; 9.6 percent had incomes between $15,000 and $24,999; 9.2 percent had incomes between $25,000 and $34,999; 12.3 percent had incomes between $35,000 and 49,999; 16.5 percent had incomes between $50,000 and $74,000; 12.5 percent had incomes between $75,000 and $99,999; 14.5 percent had incomes between $100,000 and $149,999; 7.0 percent had incomes between $150,000 and $199,999; and 7.7 percent had incomes that were $200,000 or higher. 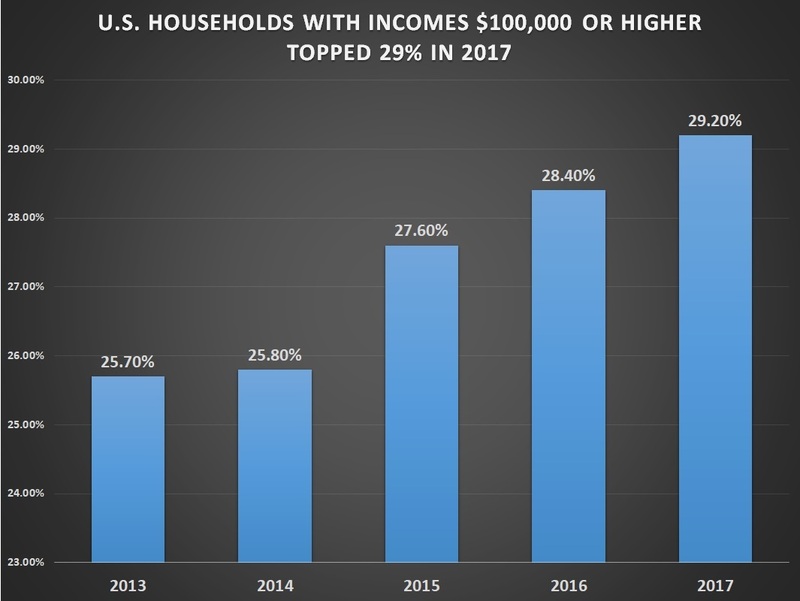 The 29.2 percent of U.S. households that had incomes of $100,000 or greater included the 14.5 percent of households that with incomes between $100,000 and $149,999; the 7.0 percent with incomes between $150,000 and $199,999; and the 7.7 percent with incomes that were $200,000 or greater. In 2016, 28.4 percent of U.S. households had incomes of $100,000 or higher, according to the Census data. In 2015, 27.6 percent had incomes of $100,000 or higher; in 2014, 25.8 percent had incomes of $100,000 or higher; and in 2013, 25.7 percent had incomes of $100,000 or higher. 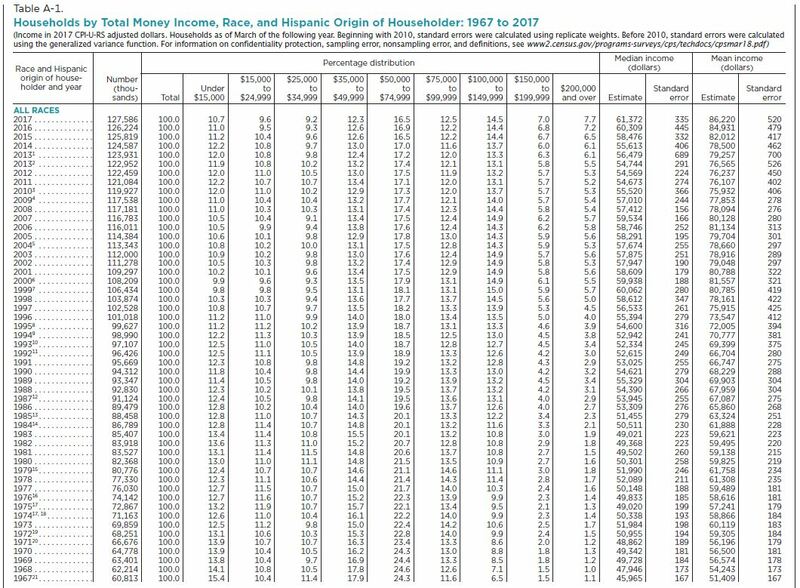 Although the Census Bureau’s Income Table 1-A publishes the percentages of households in each income bracket going back to 1967, the bureau cautions on making historical comparisons between the numbers before and after 2013--because the bureau “redesigned” its survey questions on income. “Although 2017 median household income appears to be the highest median household income ever reported from the CPS ASEC, comparisons to estimates prior to 2013 must be made with caution as the income questions were redesigned in the 2014 CPS ASEC (for income in 2013),” says the bureau’s report on income and poverty in the United States in 2017, which was released today. “[S]ince there was a statistically-significant increase in income with the redesigned questions, historical comparisons of income prior to reference year 2013 should be made with caution,” said the bureau’s report. The household income counted in the Census Bureau data includes everything from wages and salaries to Social Security benefits and welfare payments.